Panicky depositors were turned away from Stanford International Bank and some of its Latin American affiliates Wednesday, unable to withdraw their money now after U.S. regulators accused Texas financier R. Allen Stanford of perpetrating an $8 billion fraud against his companies' investors. Some customers arrived in Antigua by private jet and were driven up the lushly landscaped driveway of the bank's headquarters, only to be told that all assets have been frozen pending an investigation by Antiguan banking regulators. "I don't know what to think. I have my life savings here," said Reinaldo Pinto Ramos, 48, a Venezuelan software firm owner who flew in by chartered plane from Caracas Wednesday with five other investors to check on their accounts. "We're waiting to see some light." Banking regulators and politicians around the region are scrambling to contain the damage after U.S. Securities and Exchange Commission filed civil fraud charges against the billionaire on Tuesday. Regional Director Rose Romero of the SEC's Fort Worth office called it a "fraud of shocking magnitude that has spread its tentacles throughout the world." Specifically, U.S. regulators accused Stanford, two other executives and three of their companies of luring investors with promises of "improbable and unsubstantiated" high returns on certificate of deposits and other investments. They asked a federal judge to freeze all three companies' U.S. assets and seek the repatriation of any company assets overseas. That would include the $7.2 billion managed by the Antigua-based Stanford International Bank, which has affiliates in Mexico, Panama, Colombia, Ecuador, Peru and Venezuela. Also ordered frozen were the assets of Houston-based Stanford Group Company and Stanford Capital Management. "The fallout threatens catastrophic and immediate consequences" for the economy of the twin-island nation of Antigua and Barbuda, said Prime Minister Baldwin Spencer. Stanford, 58, has a personal fortune of $2.2 billion, according to Forbes magazine. He owns a home in St. Croix, in the U.S. Virgin Islands, and operates his businesses from Houston and Antigua, where his businesses and charity have had such a prominent role that the islands' government knighted him in 2006. Stanford's whereabouts Wednesday were not known. James Sullivan, the U.S. marshal for the Virgin Islands, said agents are monitoring Stanford's "extensive holdings" in St. Croix, including a boat he sometimes he docks there, but he could not say whether he is currently in the territory. "As of right now, all we are doing is an ongoing investigation to monitor his holdings, for lack of better term, and we are not actively pursuing him," Sullivan told The Associated Press. Stanford also has been a major political player in the U.S., where some congressmen quickly announced they would donate his campaign contributions to charity. The Stanford Financial Group, through its political action committee and employees, has contributed $2.4 million to political candidates, parties and committees in the U.S. since 1989, with nearly two-thirds going to Democrats, according to the Center for Responsive Politics, a group that tracks campaign spending. Most of that cash flowed during the 2002 election cycle, when Congress was debating a financial services antifraud bill that would have linked the databases of state and federal banking, securities and insurance regulators. The bill ultimately died in the Senate, where the biggest recipients have been Sen. Bill Nelson, D-Fla. ($45,900); Rep. Pete Sessions, R-Texas ($41,375); Sen. John McCain, R-Ariz. (28,150); Sen. Chris Dodd, D-Conn. (27,500); and Sen. John Cornyn, R-Texas ($19,700). Stanford and his wife Susan also donated $931,100 of their own money, with 78 percent going to Democrats, including $4,600 to President Barack Obama's presidential campaign last May 31. Records show $2,300 of that was returned on the same day. Governments across the region took a variety of actions Wednesday to protect Stanford assets. Colombia suspended the activities of Stanford International Bank's local brokerage Wednesday to protect "clients and investors." Panama occupied Stanford bank branches following a run on deposits, which its banking agency described as an isolated "consequence of decisions adopted by foreign authorities." Assets at the bank's four Panama branches, which reportedly held $200 million in deposits at year's end, are held largely in liquid, fixed-income investments that can easily be converted into cash to cover deposits if necessary, the bank said, and Panama's banking regulator said the regulatory move does not reflect a deterioration in the Panama branches' financial situation. In Venezuela, banking regulator Edgar Hernandez said the government was considering a bank request for help after a $26.5 million run on deposits removed about 12 percent of the holdings of Stanford Bank SA in Caracas. "We suggested an open intervention" by the government, including the possibility of the government or a state-run bank depositing funds to prop up the bank," Hugo Faria, one of the bank's directors, told The Associated Press. In Mexico, where the Stanford Fondos unit manages about $50 million for about 3,400 clients, a note posted on a shuttered office door in the capital's wealthy Polanco neighborhood announced that all accounts "are temporarily frozen." "We don't have any other information at this time, you will be contacted in the future with more details," the note said. Karina Klinckwort, 38, had rushed to the office Wednesday: "Everything I have is with them, everything that my husband, may he rest in peace, invested is with them." 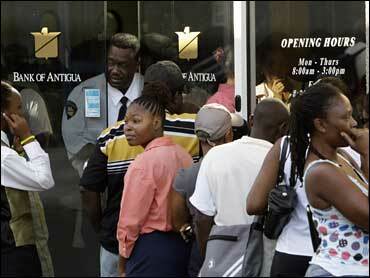 "People have to come to get their money," said Rasta Kente, an electrician in Antigua who joined hundreds of depositors in a line that stretched outside a downtown bank branch. Many clutched portable radios to listen to financial news. Regional regulators warned that panicking will only make things worse. "If individuals persist in rushing to the bank in a panic they will precipitate the very situation that we are all trying to avoid," said K. Dwight Venner, governor of the Eastern Caribbean Central Bank. Virgin Islands Gov. John deJongh said he worries the probe will worsen the U.S. territory's flagging economy, potentially costing jobs and investment in local projects. Stanford had pledged to build an office complex on land adjacent to St. Croix's airport.